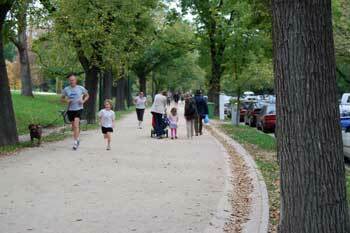 If you like jogging, there's a very well regarded 3.87 kilometre route called the Tan Track here in Melbourne. I was amazed to see how many people use it, especially around 5pm weekdays by city workers. ...........Australian Rules Football teams do it and famous runners like Steve Ovett and Cathy Freeman have apparently done it. 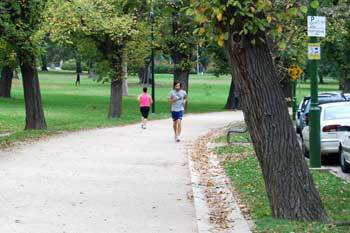 The track skirts round the Royal Botanic Gardens and through the delightful Kings Domain parkland. The track was originally a horse carriage drive for the well-off in Melbourne's early days. .........Part of the way runs alongside the Yarra River, looking across to Olympic Park (the site of the 1956 Olympics, Australia's first Olympic venue). .........I can't vouch for that though as I've only been on the track during the day and I haven't run it either! ..........It's on behalf of the Friedreich Ataxia Research Association, supporting research to find a cure for Friedreich Ataxia, a fatal, degenerative neurological disease. Find details of the event at www.fara.org.au. Check out the location of the track in the map below. Click on the blue writing beneath the map to make it larger and click on the +, - and arrows at the top left of the map as required.